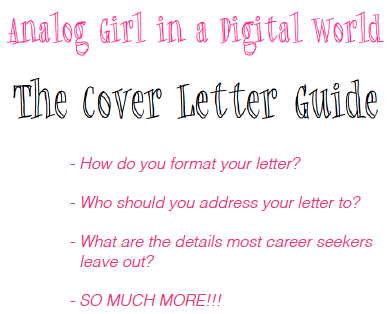 The Analog Girl in a Digital World Cover Letter Guide will give you the edge you need to make a lasting first impression and to get called in for an interview. If you're looking to get a foot in the door of the career of your dreams it starts with communicating concisely and effectively & this guide is your secret weapon! The green button below will lead you to Paypal to purchase your guide. See http://donnienicole.com with questions or for more information.